That blog post about the Great Lakes Relay is the most widely read post that I have written. I have been near-obsessed with my idea of creating organic chemistry games for the last ten months. My whole goal is bring the same kind of instant feedback (and joy, excitement, and fun!) that I deliver in my classroom to students everywhere through cool mobile games. I had wire frames and plans, and a notebook FULL of puzzles, but I was not moving forward. That is, until Kristin's tweet. 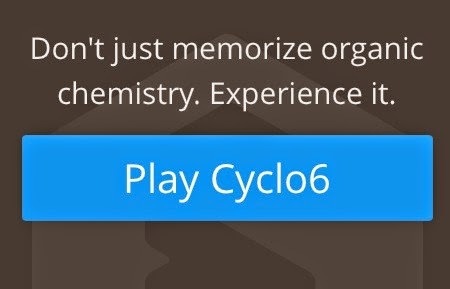 We started building my game Cyclo6 on Friday night. Jason had heard my practice pitch and was the first to jump on my team. David seemed to take control and off we went—or was it Matt? At that point, everyone looked alike to me! I did not know ANY of them. I explained my ideas and they started doing their coding thing. My parents in Plymouth were my bed-and-breakfast and rental car agency. I did not see them but for coffee after my run each morning. By Saturday evening, Ryan had add made great progress in making cool molecule-looking things dance across a screen. I had spoken with business folk from Pearson, GoKart Labs, and really connected with Curt Prins—a guy with Michigan roots. Pat was a fellow chemistry teacher, and we hit it off from the get-go. We worked on the slide deck until the doors closed on Saturday evening. All these people helping to make my dream come to life! Sunday was all about the pitch. Whoa, the work we did was intense. (My team made me go take a walk a few times—I think they were a bit nervous about my sanity!) Every word analyzed. Every slide minimalized. Dark slides, yet oh, so cool! My team would not let me see the finished game until it was ready, even then I did not really see it in action until the actual pitch. The whole weekend was a remarkable and emotional experience. (Yup, I got a bit choked up at the end of my presentation…) I thank those who put on the event and everyone else who built those other awesome educational products. My Cyclo6 team were rock stars. All of them. I can’t thank them enough. So next stop, Detroit TechWeek LAUNCH start-up contest. Playing with the big dogs, now. I have a prototype, a pitch deck, and the confidence to get this business moving forward. Amazing, all because of a Tweet.